You know him, and Steve Hackett's catalogue is prolific: 14 Releases with Genesis (1970-77), 2 Releases with GTR (1986-87), 22 Solo Releases (1970-present), and 12 Live albums. Oh yeah, did I mention that he's a damn fine guitarist and composer. Live Rails, recorded on the Out of the Tunnel's Mouth tour in New York, Paris, and London, displays the magical and immense talent of this artist. Live Rails isn't exactly a 'new' album; it's been available to fans on Hackett's website for several months. Now through Inside Out Music, it's being made more accessible to the general public. This two-disc live set finds Hackett and his accomplished band in fine form. Much of the music is from his extensive solo career and, of course, is from his most recent studio album. A most notable and exquisite piece is Every Day (Spectral Mornings) which reaches back better than 30 years for a real Hackett classic. Other gems include the three closing songs Slogans, Serpentine, and Tubehead. The second disc may trump the former, especially if you're a Genesis fan, as it includes the essential Firth of Fifth (Selling England by the Pound), Blood on the Rooftops (Wind & Wuthering), and two from The Lamb Lies Down on Broadway, Fly on a Windshield and Broadway Melody of 1974. It's a crisp and classic history lesson, but also essential Hackett. These are superb performances. But that can be said for the entire two-disc outing. There's a certain liveliness, even wistfulness, to this entire album that truly charms the ears. Except for the heavy weight placed on his most recent studio recording, Live Rails is nearly flawless. Hackett and progressive rock fans or those uninitiated into either will dig this live album. Strongly recommended. 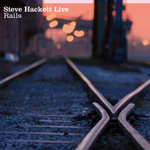 Legendary guitarist Steve Hackett offers a significant glimpse into his prolific career with wonderfully entertaining music found on the stage of Live Rails.